It was happiness for me to take a Kenmore Air seaplane out of Lake Union on July 9th as I made my way to Russell and Nicole for their wedding ceremony at Roche Harbor. This was a wedding of two very beautiful people, dear family and friends and a quest to create a “time out” for a weekend to enjoy, celebrate and to create lifetime memories. 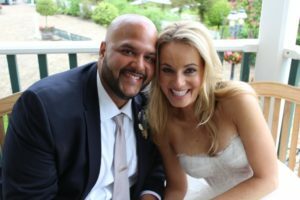 In the waterside garden of the Roche Harbor Resort, Russell and Nicole exchanged vows in the happy presence of 100+ family and friends who traveled for this much anticipated destination wedding. For ceremony, we shared a bit of Russell and Nicole’s love story, an honoring of family present, a little tribute to Russell’s daughter (and a hug), a remembrance for Russell’s Mom and Nicole’s Father and more. As the seaplane took off a few hours later, my heart was full, so grateful for the opportunity to be a small part of this happy day and weekend. Russell and Nicole…wishing you great blessings on your marriage adventure!